Today's post is my second part to my trade mail day from @TheBigCat63 on Twitter. These were the main cards I was chasing when we first discussed doing a trade. One is an obvious need, two more knock off want list needs and the final one was a just in case. Let's see what I am showcasing this time. 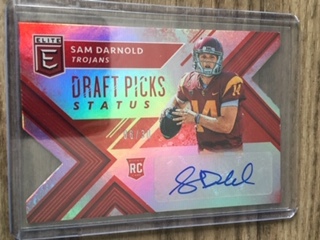 This Darnold went along with another Darnold I will be showing off in a few pictures. Everyone says the Giants should have taken him, but I will take the OROY any day still. But, I am a bit concerned about their QB situation going forward. A pair of Want List items taken off! Back in the 90's, not only was I a big time Knicks fan, but the Jazz were my backup team. Loved watching the "Mail Man" deliver and Stockton pass the ball. These two were in-sync and the Jazz were a tough team. But, when you face the Bulls in the title game, only heart ache can be achieved even when Jordan wasn't 100%. I am glad I finally get to knock these two off of my autograph needs. Still other 90's basketball players to go. I have somewhat found myself in a prospecting phase. I wanted a Darnold and Mayfield autograph all season and finally was at least able to knock one down. Darnold looked sharp at some points this season and dull as a knife in others. Will be interesting to see how his career pans out. At least now I have an autograph of him. Now this NY QB is the bigger headliner. Two-Time Super Bowl MVP and Champion. And now that those lousy Patriots won the Super Bowl again this may help Eli's cause for the Hall Of Fame as he is the only QB so far to beat Brady twice in the big game. He also beat him in the regular season as well at least once. I hope Eli does come back for one more year and give the Giants one more last run. Well, this is still only part two of our meaty trade. The big bacon, well at least to me, comes tomorrow when I go non sport on ya! Congratulations! Don't collect basketball anymore, but Stockton and Malone signatures were pretty hard to come by back when I did collect. Wow, Stockton and Malone autos in the same trade! I can't imagine anybody actually wanting to trade these away, but it's cool that you were able to find someone who was willing to do so.